In 1900 American scientist R.A. Fessenden transmits human speech over the air. Marconi spans the Atlantic Ocean via wireless in 1901. 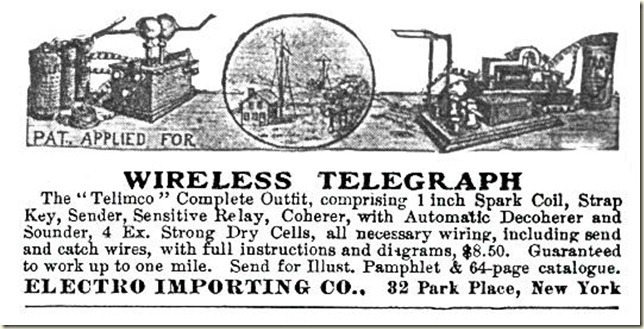 Wireless telegraph services link the five Hawaiian islands.You can build your own wireless telegraph systems using a kit containing all the parts and plans for only $8.50. Kodak introduces the Brownie camera. It costs $1.00. The Wright Brothers take flight in 1903 and Valdemar Poulsen patents an arc transmission scheme that generates continuous radio waves, producing a frequency of 100 KHz, receivable 150 miles distant. 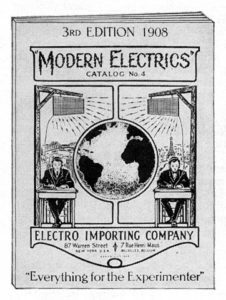 In 1904 immigrant Hugo Gernsback launches the Electro Importing Company of New York City to sell wireless equipment to early experimenters. Hugo was (is) a hero of mine. Learn more about him HERE and HERE. Lee de Forest shows off a car radio at the 1904 St. Louis Exhibition. No push buttons or cassette deck though, and not much to listen to. Learn more about early car radios HERE. A chap name Fleming develops a tube he calls the Fleming Valve in 1905. It’s a diode much like Edison’s earlier invention. And while there’s some disagreement as to who transmitted the first voice and music “broadcasts,” many believe it was R. A. Fessenden’s 1906 Christmas Eve program that marked the start of entertainment radio. He read Bible passages and played O Holy Night on the violin. Mariners at sea were his intended audience. Scheduled broadcasts were still in the future, and their exact arrival on the scene is another source of historical debate. Around 1906 the term radio first begins to appear in print as a synonym for wireless. By adding a grid wire to Edison’s Diode tube Lee De Forest invents the triode, or audion tube making amplification a reality. The first Victrola is manufactured. The San Francisco earthquake kills 3,000. The first New Year’s Eve ball drops in New York City. The first Model T Ford rolls off the assembly line. 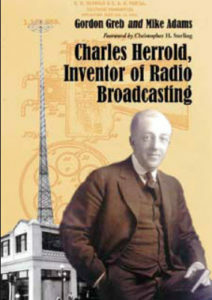 In 1909 San Jose, California electronics instructor Charles David Herrold begins operating what is arguable the world’s first broadcast radio station complete with a published programming schedule, and eventually commercials, (initially publicity for local record stores in exchange for music to play). Was this also the first payola? Here's a great book about Charles. Perhaps one of the first truly functional portable radio was constructed by Francis Dunmore in 1909. It was housed in a suitcase and did not require an external antenna or ground connection. Amateur operators are using audion tubes, cascade tuning schemes and heterodyne technology in their homegrown gear by about 1913. As their signal range increases the government steps in to license hobbyists and issue call signs. In 1914 Edwin Armstrong’s at work again, this time patenting what is essentially regenerative circuitry to boost receiver selectivity and sensitivity. To what will be the chagrin of parents for decades to come the moving coil loudspeaker is invented by Ray Kellogg in 1915. A young American Marconi employee, David Sarnoff writes a memo in 1915 describing a “radio music box” that would make radio a household utility similar to a piano or phonograph. It doesn’t fly, at least not just yet. One-million Ford automobiles have been shipped. Superheterodyne technology emerges in 1918 from none other than Edwin Armstrong. It’s the backbone of most radio receiver circuitry in use today. World War I is in full bloom. In 1919 President Woodrow Wilson broadcasts to American Troops in Europe. 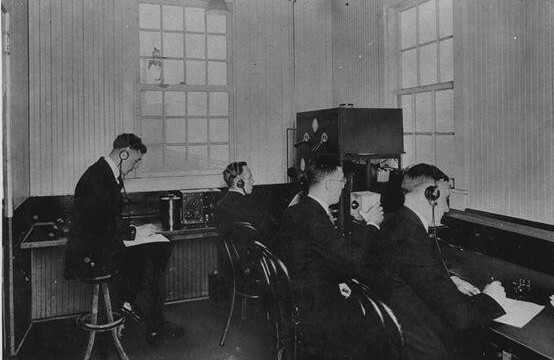 This is the first Presidential radio broadcast. The Radio Corporation of America, (RCA) is founded. The Boy Scouts of America create the Wireless Merit Badge. In 1920 the first licensed commercial radio station takes to the air. It’s KDKA in Philadelphia, Pennsylvania. By the mid-twenties vacuum tubes revolutionize radio transmission and reception. Crude television pictures are being sent and received. 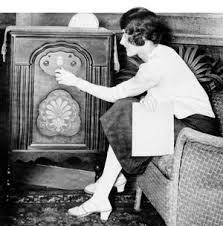 Radio madness grips consumers in the twenties. Everybody wants a radio, and many homes and farms get them. Newspapers and magazines fuel the flames as they gush about this new fad. Atwater Kent, Zenith and RCA become household names. Experimenters are building early receivers. 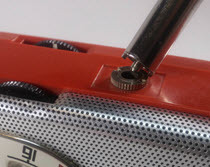 Radios, whether purchased from a store or home-built are difficult to operate, requiring much tuning and fussing. While some sets sold beginning around 1922 had built-in antennae, most commercial radios of the era worked best when connected to an antenna and grounded through a water pipe or other earthly connection. Static, squawks whistles were at least as commonplace as programming. Most are battery operated in the early twenties. Bulky, expensive “all electrics” and external battery eliminators hit the market in the middle of the decade. A company called the Chicago Radio Laboratory (soon to be renamed Zenith) starts selling what many believe is the first practical portable radio around 1923 or 1924. 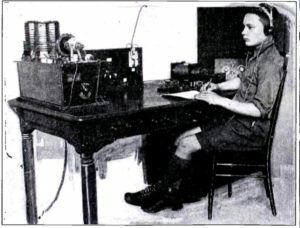 The Boy Scouts of America rename the Wireless Merit Badge to the Radio Merit badge. Spark Gap transmissions are outlawed in 1927. They cause too much interference in the radio spectrum. It helps, at least a little. Static from electric streetcars, home appliances, lightning storms, and industrial motors drive listeners crazy. A better technology is needed. By 1930 radios became furniture and works of art. They are the focal point of many living rooms and women become more and more influential in their purchase. Portables are not very popular in the early thirties. Here's a great article describing "The internet of the Thirties." The Great Depression led to an obvious need to re-think radio manufacturing, and many cost-cutting techniques evolved, including lower cost cabinetry. The ubiquitous tabletop “tombstone” sets were born in the depression era, for example. Innovator Edwin H. Armstrong patents FM broadcasting technology in 1933, and the FM first station goes on the air in 1937 broadcasting to what must have been a very small audience. He does largely solve the static problem though, and gives manufacturer’s an excuse to sell all new gear to broadcasters and listeners alike. Here's a great article. By 1938 the improved economy and technological advances make portable radios cool again. They looked more like luggage than radios, but they could be and were hauled about. People even began complaining about how disruptive their noise could be in public places. By the early 1940s “miniaturized” tubes were commonplace although these would shrink further in size to become subminiature before giving way to transistors. Portable radios became lunchbox-sized and smaller. Sadly World War II put a damper on consumerism again, but did provide more technical innovation. It was the end of that war, and the return of our parents from it that spawned us, and the radios we fell in love with, but not without some false starts. 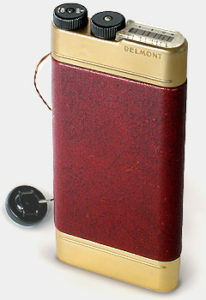 In 1945 a beautiful little five-tube shirt pocket portable radio dubbed the Belmont Boulevard 5P113 was introduced. It measured a scant 3” X 6-1/4” X 5/8” and easily slipped into a man’s pocket or woman’s pocketbook. It was a marketplace disaster. Perhaps fewer than 5,000 were sold. This makes them very collectible today, obviously. In 1948 Bell Labs shows the world one of its most-promising inventions, the transistor. 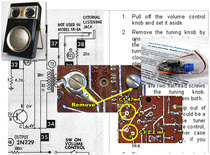 One of the ways it demonstrates this potential replacement for the vacuum tube is with a prototype all-transistor radio. 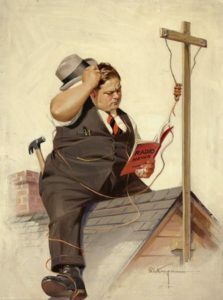 The press and general public mostly react with an unenthusiastic “uh huh…” A handful of well-connected hobbyists and engineers thought otherwise, and got to work on the first transistorized radios, which were likely built in 1950. PBS has some great info HERE. And so, we enter the "Transistor Era." What's the first radio you remember? Have you collected any radios from your childhood? Do you have tips and experiences to share? Questions? Suggested corrections or additions? Leave a comment below. I’ll review comments and post or incorporate the most useful ones. Your email address is required if you choose to comment, but it will not be shared.